As all Derek fans know, the underlying theme of the show is 'Kindness is Magic' and today I stumbled upon a fantastic example. I watched Derek once again and for somebody who runs a Derek fan site I thought I had seen it all - every detail - but I was wrong. The camera panned to the sign in front of Broad Hill Care Home and I noticed that the home has a website - www.broadhillcarehome.com. Has anyone else noticed this? 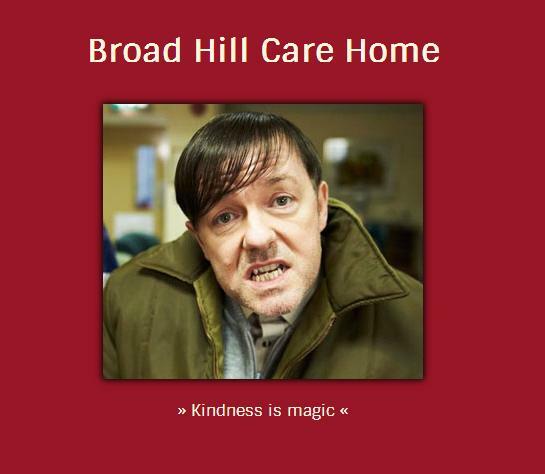 So, I went to the website and there are the words 'Broad Hill Care Home', a picture of Derek and the words 'Kindness is magic'. I managed to contact the owner of the site and thanked him. The owner runs a web development company in the UK - www.rocketsites.co.uk - and he wanted to spend some time, and a few quid on the web domain registration, to help raise awareness for the cause. I've witnessed 'kindness is magic' with the cast and crew, with the 15,400 Twitter followers and 1,000 Facebook fans, but this was just fantastic. Thank you for this - it just goes to show how the show has brought out the best in people.